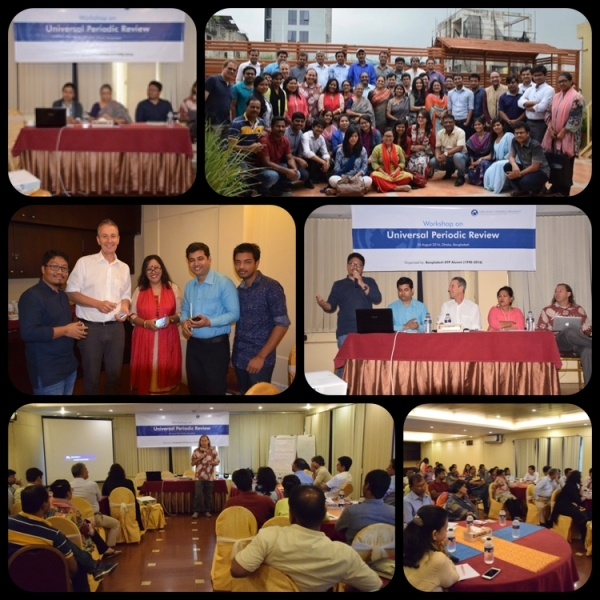 Over 30 civil society advocates working with and for migrant workers from Bangladesh participated in a special year-long capacity building program with Migrant Forum Asia (MFA): the Diplomacy Training Program (DTP). MFA and DTP worked in partnership with local NGOs – WARBE and RMMRU. The program was funded by SDC. What Can Participants Gain From The Program? Knowledge and understanding of other international forums and processes relevant to migration with a special focus on the Global Forum on Migration and Development (GFMD) and the Post-2015 Sustainable Development Agenda. The workshop was organised in Dhaka by alumni of DTP and took place on 26th August 2016. This was the first such initiative of the DTP alumni in Bangladesh. There were 50 participants in the workshop, drawn from over 17 NGOs and CSOs working on a diverse range of human rights issues in Bangladesh. One of the potential advantages of advocacy around the UPR process is that covers all human rights and that it creates a space for organisations working on different human rights issues to come together, and develop complementary strategies and approaches with a long term perspective. From August 15-19, 2005 the Diplomacy Training Program facilitated a capacity building program in Dhaka, Bangladesh for 24 advocates from Bangladesh, Burma, Indonesia, Malaysia, Nepal, Timor Leste and Vietnam. A major benefit from the course is the opportunity to learn from and network with others in the region.